With the passing of the ages empires are created and destroyed, new cultures appear and then again fade, like changing seasons into the shadows of eternity. Vanishing into oblivion, all that remains of those that were once great and powerful in this world are but a handful of relics. Time, the destroyer of all things, vanquishes even the most invincible empires leaving behind their remnants to be marveled at by future civilizations. And marvel we do at the wonders of the past, especially the architectural wonders. Be it the pyramids of Egypt, the cathedrals of Rome, the Parthenon of Athens, the Forbidden City in Beijing, or Stonehenge, our mind is at once awed by the beauty and grandeur of ancient architecture. Until recent years modern society has viewed much of the world's ancient architecture and art as "simply decorative" or, in a general sense, as a tribute to God; not that it might have any "practical" function in helping us to understand tha nature of the world we live in. However, recent studies in the field of sacred architecture (Vastu Shastra) by men like Keith Critchlow of the Royal College of Art in London have uncovered hidden dimensions revealing a far-reaching connection between architecture and the nature of existence. Critchlow, perhaps the best-known advocate of the theory of sacred architecture, believes that basic architectural principles on the physical level are integral with structure on the metaphysical level. Yali, Protector of the Temple. Most sacred architects maintain that the ultimate reality exists beyond the mundane plane of temporary forms. As such, that higher reality, infinite in nature, can make itself known to the finite living entities, in the world here below. It does so through revealed forms which, while seemingly limited and temporary, provide a bridge between the finite and the infinite. Some regard the ideal forms of sacred Vastu architecture as metaphors while others prefer to see them as fixed, eternal truths. In any case it is a fact that sacred architectural forms (as presented in the Vastu Shastra) have the ability to uplift the human consciousness from the mundane reality to the supernatural. William Irwin Thompson of the Lindisfarne Mountain Retreat in Colorado says about his chapel, "Anyone entering our chapel-no matter what their religion-would feel the sacred calling of the place and wish to sit in silence." Architect Michael Baron reports that people sometimes cry the first time they enter the Lindisfarne Chapel. He explains, "They find it touches something very familiar inside them. Others don't say a word; they sense the sacredness of the place. They may not be sure what's going on, but they are affected by it." The knowledge of sacred architecture in India has existed in the oral tradition since before the Vedic Age, some five thousand years ago. From the oral tradition it was later recorded in the Sanskrit mantras and compiled under the title Vastu Shastra. According to Indian authorities the Vastu Shastra is possibly the oldest known architectural treatise in the world today. The word shastra means literature or more accurately "enlightened literature." The word vastu, meaning the manifest, comes from the word vustu, meaning the unmanifest. The philosophical purport of the words vustu and vastu form the basic concepts of India's sacred architecture and are among the first lessons taught to the students of Vastu Shastra. That which is manifest in this world, vastu, it is said, is originally existing on the plane of the transcendental or unmanifest, vustu. To instruct the beginning students of the Vastu Shastraabout the meanings of vustu and vastu, the unmanifest and the manifest realities, the example is used of the moon and its reflection in water. "The moon is present in the sky, but when rising above a lake it becomes visible or manifest in the water. In the same way the origin of all things exists first in the eternal reality and then becomes manifest here below in the world of gross sensual objects." This simple analogy demonstrates the nature of vustu, that which exists eternally, and vastu, that which is temporarily manifest. The students of the Vastu Shastra thus perceive existence in terms of two dimensions: first the infinite spiritual realm and second the finite accommodating space for insentient material objects. This concept of a superior plane of existence, where the original form of things exist eternally, is the basis of India's sacred architecture. We visited several classrooms at the college where students are taught the variety of skills and techniques necessary in the science of sacred architecture. Beginning with concept and design, the students are taught each and every aspect of sacred architecture: geometry, drafting, stone sculpture, bronze casting, wood carving, painting, etc. All the textbooks and reference materials are written in Sanskrit, which every student is required to learn. Those students who excel in all phases of sacred architecture will graduate with a degree in architectue and receive the title Sthapati. Those students specializing in a particular department of sacred architecture like sculpture or painting become certified as Master Artisans. After earning a degree graduating students will have the opportunity to apply their designing skills in building temples and other facilities requiring knowledge of the Vastu Shastra. First of all it is necessary to select a suitable place where the temple should be built. The suitable choices are mentioned in the Vastu Sastra: "The best location to build a temple is at a tirtha(holy place)." "A tirtha," says Ganapati Sthapati, "is a ford or crossing place from this world to the above-a point of marriage between transcendence and the mundane. A tirtha provides a crossing place for the upward journey of the soul and a place for the downward crossing-for the crossing of higher entities who sometimes descend to this world for the good of mankind." Next a construction plan is required and here begins the highly technical aspect of sacred architecture-to bring about the descent or manifestation of the unmanifest and unseen. Ganapati Sthapati explained this process to us in great detail. "The architect or Sthapati begins by drafting a square. The square is literally the fundamental form of sacred architecture in India. It is considered the essential and perfect form. It presupposes the circle and results from it. Expanding energy shapes the circle from the center; it is established in the shape of the square. The circle and curve belong to life in its growth and movement. The square is the mark of order, the finality to the expanding life, life's form and the perfection beyond life and death. From the square all requisite forms can be derived: the triangle, hexagon, octagon, circle etc. The architect calls this square the vastu-purusha-mandala—vastu the manifest, purusha the Cosmic Being, and mandala, in this case, the polygon. "When completed the vastu-purusha-mandala will represent the manifest form of the Cosmic Being; upon which the temple is built and in whom the temple rests. The temple is situated in Him, comes from Him, and is a manifestation of Him. The vastu-purusha-mandala is a mystical diagram. It is both the body of the Cosmic Being and a bodily device by which those who have the requisite knowledge attain the best results in temple building." The conception of the "Cosmic Being" as a person has held a prominent place in Indian theistic thought since time immemorial. We were shown an interesting quotation in the ancient Sanskrit literature that illustrates the personal features of the Cosmic Being. "The planetary systems in space from the highest down to the lowest represent the head, neck, chest, thighs, legs and feet, respectively, of the Great Universal Being. His arms are the divine entities headed by Indra, the ten directional sides are His ears, and physical sound is His sense of hearing. His mouth is blazing fire. The sphere of outer space constitutes His eye sockets and the eyeball is the sun as the power of seeing. The rivers are His veins, the trees are the hair of His body and the omnipotent air is His breath. The passing ages are His movements." The perception of the Cosmic Being is considered to be the preliminary stage of self-realization and thereby a qualified form of pantheism.which gradually leads one to understand the personal feature of the transcendent Godhead. The concept of spirituality in the system of sacred architecture in India is something that goes beyond the mere static relations between inert objects and space as found in other architectural traditions. The relationship of objects with one another and space in India's sacred architecture extends to include higher entities said to be in charge of various aspects of universal affairs, all of whom carry out their work in accordance with the will of God. Based on astrological calculations the border of the vastu-purusha-mandala is subdivided into thirty-two smaller squares called nakshatras. These nakshatras correspond to the constellations or lunar mansions through which the moon passes in its monthly course. The number thirty-two geometrically results from a repeated division of the border of the single square. It denotes four times the eight positions in space: north, east, south, west, and their intermediate points. The closed polygon of thirty-two squares is now symbolical of the recurrent cycles of time as calculated by the movements of the moon. Each of the nakshatras is ruled over by a divine entity, called a deva, which extends its influence to the mandala. Outside the mandala lie the four directions, symbolic of the meeting of heaven and earth and which also represent the ecliptic of the sun-east to west and its rotation to the northern and southern hemispheres.. The center of the mandala is called the station of Brahma, the first of beings and the engineer of universal order. Surrounding Brahma are the places of twelve other entities known as the sons of Aditi, who assist in the affairs of universal management. The remaining empty squares represent the akasha or pure space. The vastu-purusha-mandala is now complete,forming a sort of map or diagram of astrological influences that constitute the order of the universe and the destinies of human lives. When placed on the building site the vastu-purusha-mandala determines the time for beginning construction. Only by the combination of the vastu-purusha-mandala and astrological calculations can this factor be ascertained. The temple itself should always face east as that is considered the most auspicious direction-the place of origin of the sun. From the east appears the rising sun, the destroyer of darkness. The sun is the giver of life. It brings joy and happiness and is the watchful eye of the "Cosmic Being." The vastu shastra states that a building with improper proportions and wrong orientation will create an environment which is conducive to disturbances like disease, death and destruction, and may be inhabited by subtle entities with envious and deceitful natures. As we learned more and more about the science of sacred architecture, it became apparent that the construction of a domestic building or of a temple is something like the birth of a human being-who according to the time and place of his birth will come under certain astrological influences throughout life. The time of construction, the place and position of a structure are all important factors for the future of the building. Therefore, according to the vastu shastra, all structures should be erected according to auspicious astrological calculations to assure successful execution, longevity, and lasting prosperity. From the diagram of the vastu-purusha-mandala the architect next proceeds to develop the vertical and horizontal dimensions of the temple. Here too a wide range of factors must be taken into consideration. To guide the sacred architect of today a long and rich tradition of already existing temples and sacred buildings in India serves as a great inspiration to his work. The architect's creative intelligence will be an all-important ingredient in the final design, while the mandala and the vastu shastra will continue to be the tools of his execution. The brahmasthana is said to be the principal location in a temple since it is here that the seat of Godhead will eventually be placed. At the base of the foundation of the brahmasthana, located at the station of Brahma on the vastu-purusha-mandala,a ritual is performed called garbhadhana, the ritual which invites the soul of the temple to enter within the buildings confines. In this ritual a brahmin, priest, places a golden box in the earth during the ground-breaking ceremonies. The interior of the box is divided into smaller units exactly resembling the vastu-purusha-mandala. All the units of the gold box are first partially filled with dirt. In the thirty-two units representing the nakshatras (lunar mansions), the units of Brahma and the twelve sons of Aditi, the priest places an appropriate mantra in written form to invoke the presence of the corresponding divinity. In the unit of Brahma a golden serpent with many raised hoods is placed. The serpent form is then surrounded with nine precious jewels or navaratna. Ananta represents the energy which supports the very existence of the universe. The universe rests in space and that space is the energy of Godhead appearing as Ananta. The nine jewels- diamonds, emeralds, rubies, pearls, yellow sapphire, blue sapphire, red coral, cats-eye and jade-invoke the astrological influence of the nine planets. A gold lid with the seven continents of the earth engraved on it is placed on top of the box. When this is done the priest then performs the ritual sacrifice or sanctification ceremony called agni-hotra, the fire sacrifice. During the agni-hotra the priest offers clarified butter, the symbol of religious principles, into the fire, which represents the mouth of the Cosmic Being. Along with the offering of clarified butter five types of grains-rice, wheat, barley, rye and dhal, all produced of the earth-are also offered in the fire. 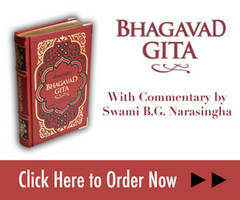 This too is performed with the chanting of mantras. Once the garbhadhana and agni-hotra ceremonies are complete the actual construction of the temple takes place according to the previous preparations. When the foundation is finished the vertical structure is raised and the body of the Cosmic Being becomes visible to the naked eye. The external features of the temple are brought to life through finely sculpted figures and paintings. The art and sculpture frequently portray the forms of divine entities and the different stages of consciousness in the gradual evolution of life throughout the universe. This is no less exacting a science than that of the architect or of the brahmin priest. Muthai Sthapati, an instructor at the Goverment College Architecture, pointed out that it is often the work of the master artisan, through painting and sculpture, that most enables one to perceive the actual sacredness of the temple. The vimana or tower, also called the shikara, is raised to its final height above the sanctum as the last stones are put into place. Resembling a great mountain, the vimana is crowned with a golden spire called kailash, the heavenly abode. At the sides of the vimana are fixed the fierce faces of Yali, the protector of the temple. The temple is now ready for the ceremony known as pratistasthana, the installation of the deity. The scared altar in the brahmasthana, central shrine, is located directly above the gold box, placed in the earth during the garbhadhana ceremony. Here on the sacred altar representing the heart of the Cosmic Being, the deity of Godhead called the archa-vigraha, the manifest form of total divinity is installed. The mandala, the mantra, and above all the sincerity and faith of the participants combine together to invoke the appearance of Godhead. The universe is the manifestation of the divine form of Godhead in the world of mundane existence. The body of the temple is the representation of that cosmic form, whereas the archa-vigraha is the manifestation of the transcendental form of Godhead descending from beyond the mundane. The ceremony for installing the deity is performed with great pomp and upon its completion the temple is complete..
1. Keith Critchlow, Order in Space, Thimes and Hudson (1969). Reprinted from Clarion Call Magazine by permission.